If there was a category for the most forgettable speeches in the world each spring, it would be for those delivered at graduation ceremonies. But in 2016, that changed when a young man by the name of Donovan Livingston stood before the crowds gathered to hear his remarks to his fellow graduates at Harvard University. His speech began safely, with a quotation, a tried-and-true technique, although over-used for generations. But then, in an amazing display of creativity, Livingston broke all the rules. Instead of the standard platitudes and well-wishes, he launched into a spoken-word-poem as a speech and his image was so vivid it drew an emotionally overcome audience to its feet at the end. In this article about techniques to get an audience on your side, it is a master class all by itself. Livingston, now a social science research assistant at Harvard, is humble, genial and straightforward. Then he pulls out his inspired content and vivid imagery, and the room is his. Clearly Livingston understood that opening with a quotation, which still remains a standard especially for student speakers, is not sufficient. As hard as we search to find the perfect quotation to open and close speeches, and as eloquent as the words of past orators are, always remember that the quotations of others are forgotten fast, but the words you say from your heart stay with the audience forever. They are there to hear you, even though it is tempting to use these colorful quotations from history to help make your point. Livingston’s speech proves once again that making presentations that your audience supports is not a trick or a gimmick: it is simply delivering eloquent, amazing content that touches people deeply and inspires them to reach out and share your message. Delivering amazing content doesn’t mean that you can’t use a prop or a bit of humor, however. That was evident in another speech that brought the audience to its feet in support of Mohammed Qahtani, winner of the Toastmaster’s 2015 World Champion of Public Speaking award. Standing on stage, reaching in his pocket and pulling out a cigarette, putting it to his lips and then flicking his lighter, the quirky speaker elicited a shocked response from his audience. Then he made them laugh by quoting some amazing statistics which he then revealed he had made up. By this time the audience was hooked. What would happen next? What happened next was that Qahtani delivered a world-class presentation on the power of words. Qahtani’s unorthodox opening mixed with humor and effective facial expressions caught people’s attention and when he was ready to hammer home his message, they were already on his side. “Words have power, words are power, words could be your power,” he told them. One thing Qahtani used effectively was humor, but note that he did not actually tell jokes, the old stand-by for openers. These days, with an increasingly diverse audience in attendance at every event, jokes are quicksand that can take you down if you misunderstand the cultural implications of your story even in a small way. If you want to get the audience on your side with humor, do as Qahanti did by poking fun at his own actions, not at the actions of others. The presentation of a powerful message for change can fall on unresponsive ears unless the speaker can bring the issue into the lives and hearts of the audience. Caitlyn Jenner, in her acceptance speech for the Arthur Ashe Courage Award managed to bring her audience onside through her remarkably straightforward talk. As you listen to these excerpts from Jenner’s message, you sense the emotion building. By the time she tells her story and vows to “reshape the landscape of how trans issues are viewed and how trans people are treated,” she has the audience following every word. What Jenner illustrates best is not only how to grab the audience’s attention (her personal appearance alone satisfied the curiosity seekers) but how to keep their attention. She reached out to thank her children in an emotional moment and talked about the everyday things that women take for granted that she had to get used to. Telling a moving personal story remains one of the all-time best public speaking tips to get and keep an audience on your side. The more unusual the story is, the more the audience will be fascinated. Note that Jenner also refrained from glorifying herself with her stories. Instead she focused on the impact of her decision on those around her and on urging others uncomfortable with their gender to take the necessary steps to live life on their terms. 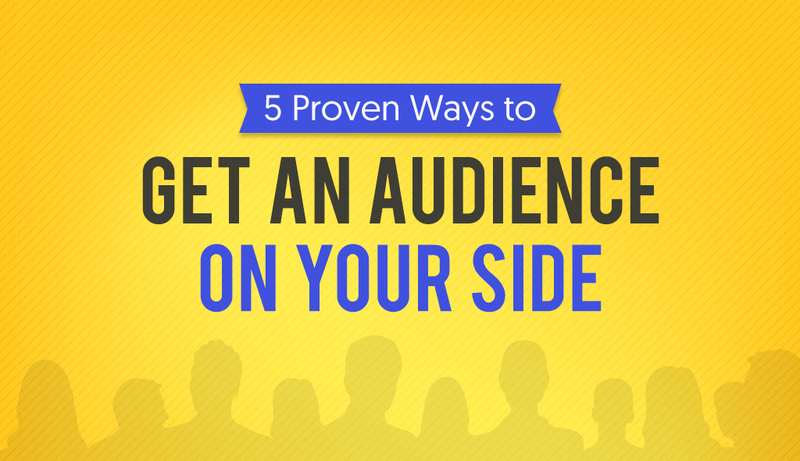 This approach scores higher with any audience. She didn’t brag; she didn’t exaggerate. Her direct speaking style was refreshing to her audience and effective in bringing them on her side. Telling a great story works well in bringing an audience on your side, as illustrated by Jenner’s remarks, but it gains even more power when you combine the story with another great technique, and that is asking your audience a question. When self-help guru Amy Morin did both in her speech “The Secret of Becoming Mentally Strong,” her audience was onside immediately. Morin, a licensed clinical social worker, psychotherapist and lecturer at Northeastern University, is adept at building a bridge to her audience. In fact, she not only bridges to them, but mentally they climb up on that bridge and start walking toward her. She knows how to use the best techniques in a way that is so natural, her audience is unaware that they are seeing professional tactics of presentation science at work. If you opt to tell a personal story, make sure that it is closely connected to your theme. Also, make sure that it is not more than a minute or two in length. Another important strategy for bringing audiences on your side is ensuring that if you are going to talk about technology or science or any subject that is complicated and out of the mainstream of common knowledge, be sure to break down the concepts you present to comparisons and word pictures that your audience understands. Gilbert makes his point by explaining from the beginning how the human brain works, and how cognitive judgments are formed. Then he illustrates that we can all misinterpret our own happiness or well-being because of our cognitive interpretations and false assumptions. He makes it clear to his audience that they have the power to try out life experiences before actually doing them for real. He takes complicated concepts like our experience simulator and impact bias and shows how we can mislead ourselves. But when we master these brain responses, we can live and interpret our experiences in a more positive way. As all of the impressive presentations mentioned illustrate, there are lots of public speaking tips you can apply to bring your audience on side with you, but the foundation of all of them is having something worthwhile to say and a straightforward vocabulary to ensure that your audience grasps it. In the presentation game, there is a huge element of showmanship, but in the end, that only works to impress people when you still deliver content that creates value in their lives. What public speaking tips would you recommend to get an audience on your side? Let us know in the comments section below! Ashish Arora is the Co-Founder of SketchBubble.com, a leading provider of result-driven, professionally built presentation templates. Travelling the world to gather new creative ideas, he has been working in the digital marketing space since 2007 and has a passion for designing presentations. You can also find him on Twitter or LinkedIn.